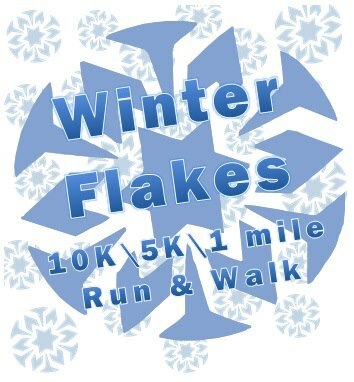 The Winter Flakes 10k/5k/1-mile Run & Walk is the biggest race held in De Soto! It is fun for the whole family and a great winter activity! Proceeds from the race go to Get Healthy De Soto, a non-profit whose mission is to make a long-lasting impact on the health and safety of our community by encouraging healthy lifestyle choices through the promotion of physical activity, healthy nutrition, weight control and disease and injury prevention. All abilities and speeds are encouraged to participate! Strollers are welcome! Please come and join us for a fun-filled winter activity! Course | The 5k course is a nice flat out and back course that runs beside Joachim Creek, the railroad tracks and through one of the most picturesque parks in De Soto. The 10k course follows along the 5k route until it turns into town. It is also relatively flat, but does have a few hills in town. It runs past De Soto High School and through two of the most beautiful parks in town.